Sydney Airport and the Museum of Contemporary Art Australia (MCA) this week announced that Toowoomba-born Kamilaroi artist Archie Moore has been selected to realise a major work of contemporary art for the airport’s T1 International Terminal. 'United Neytions' is a significant work that will give a strong sense of place in its location at the airport. Its 28 large flags – all invented by Moore - will hang from the dramatic 17-metre high ceiling of the Marketplace. 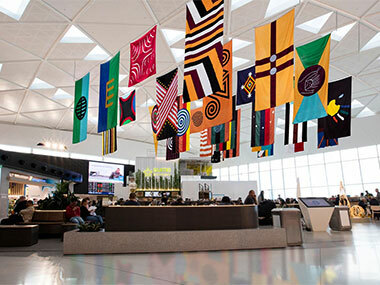 The distinctive graphic designs of the flags reflect the diversity of Aboriginal cultures in Australia and the gentle movement of the flags will produce a calming effect, creating a welcoming presence at Australia’s gateway airport. Will it also encourage people to shop? MCA Director Elizabeth Ann Macgregor OBE said Mr Moore’s United Neytions was chosen from an outstanding group of proposals. “I congratulate Sydney Airport on the choice of Archie Moore – one of our most important contemporary artists – for this important commission. Archie Moore has approached this exciting opportunity with great flair and his visually striking installation will no doubt intrigue, engage and capture the imagination of the millions of passengers passing through the airport’s International terminal every year,” Ms Macgregor said. In the past, Archie Moore has caught the eye with much smaller works - origami churches folded from pages of the Bible; a selection of scents that captured times and places from his earlier life. “I’d like to thank Sydney Airport for the opportunity to reconfigure United Neytions”, commented Archie Moore. For Moore originally developed the installation for the 2014 exhibition 'Courting Blakness' at the University of Queensland. That iteration featured just 14 flags, based a map created by RH Mathews in 1900. Mathews was a self-taught anthropologist and non-Indigenous and his map contained many inaccuracies. Moore: "I was interested in that, and how thorough his research was, and whether it was influenced by notions of racial superiority, and how much care he took. For example, for one of the nations in Western Australia, he couldn't find the local name for it so he just named it after a sheep station in the area. But I like it that Mathews called these communities nations”. A much more authentic map of tribal Australia was developed in the middle of the 20th Century by Norman Tindale. Moore's designs for the flags were inspired by local designs for each nation. "I superimposed Mathews's map over the contemporary Indigenous map and saw what groups of people were inside the boundaries he drew, and researched their designs, body art, dendroglyphs and unique geographic features," he said. "I was trying to find unique things for each group”. "They're not real flags. They're artworks. It's exploring notions of authenticity and knowledge, and who has access to that knowledge”. Moore continued: “This opportunity has allowed these flags that celebrate issues of place and identity to adopt a scale and status that official international flags have; drawing attention to the histories, voices and presence of local Indigenous people on whose land the airport – an international zone/'no man's land' – lies, but also the passages of cultures, pasts, territories, ages and cultural knowledges that airports foster,” Mr Moore said. 'United Neytions' subsequently appeared at Carriageworks in Sydney in 'The National 2017: New Australian Art'. The work was selected by a panel chaired by the project’s art curator Barbara Flynn and panel members included Kerrie Mather, Greater Sydney Commission Chief Commissioner Lucy Turnbull AO, City of Sydney Design Director Bridget Smyth, and MCA curator, Blair French. 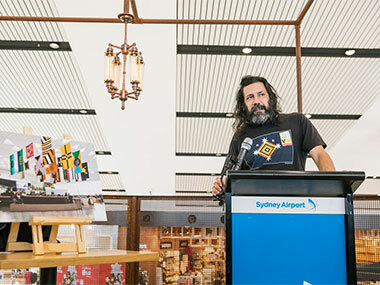 The project’s art curator Barbara Flynn added, “Moore was one of eight leading Australian artists, including four Aboriginal artists, competing for the honour of realising a work of art at Sydney Airport — Moore is an inspired choice”. The installation will be completed and unveiled in 2018. Perhaps we'll discover then why Moore has chosen to spell Neytions that way? 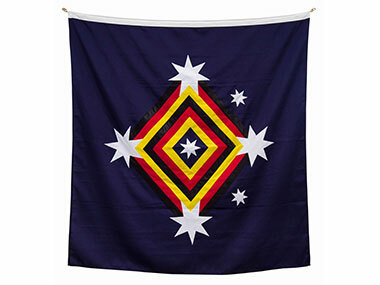 The Kamilaroi Nation's flag as devised by artist Archie Moore. Could it become Australia's national flag too?